silicon tetrapods or zigzag wires formation, besides straight SiNWs. a possible structural model to study the SiNW in theory. Tunneling Microscopy (STM) in experiments [19,20]. forming a wire-like structure was focused in this work. less than 0.04 eV/A in the geometry optimization. used to study the H-terminated cluster. CDSiNWs formation with H-terminated clusters. silicon atoms were 3-fold or 4-fold in the cluster. orientation of the arrangement were modified manually. (110)-(110) dimer and (e) (111)-(111) d imer respectively. Figure 1. Atomic structure of relaxed Si29 cluster. dimer and (e) (111)-(111) dimer. cluster automatically, no matter in which direction. corner-like structure and Figure 3(b) a chain-like one. son of the cluster growth. corner-like structure and (b) is a chain-like one. beneficial discussion with Dr. Lijuan Zhao and Prof.
Blocks,” Science, Vol. 291, No. 5505, 2001, pp. 851-853. X. H. Sun, N. B. Wong, C. P. Li, S. T. Lee and T. K.
Applied Physics, Vol. 96, No. 6, 2004, pp. 3447-3451. F. Sacconi, M. P. Persson, M. povolotskyi, L. Latessa, A.
Pecchia, A. Gagliardi, A. Balint, T. Fraunheim and A. D.
No. 1-3, 2007, pp. 329-333.
tus Solid (b), Vol. 242, No. 12, 2005, pp. 1-6. D. D. D. Ma, C. S. Lee, F. C. K. Au, S. Y. Tong and S. T.
ence, Vol. 299, No. 5614, 2003, pp. 1874-1877. Vol. 8, No. 9, 2008, pp. 3004-3009. 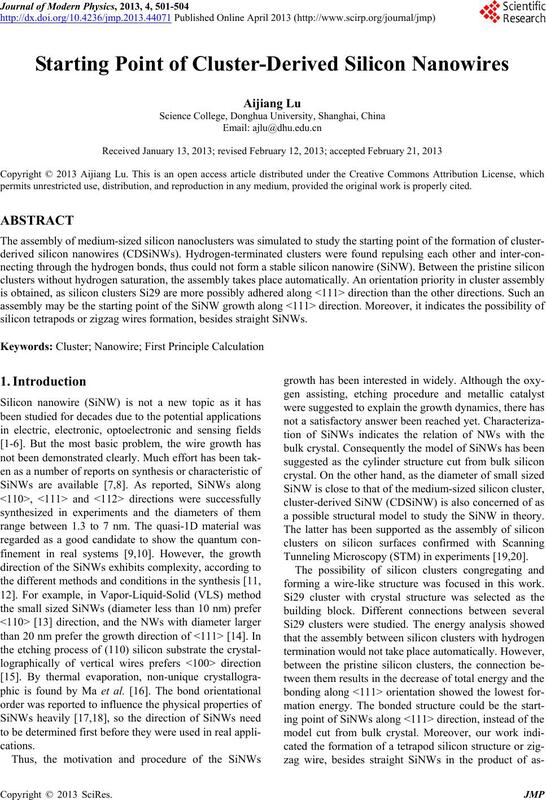 Y. Cui, L. J. Lauhon, M. S. Gudikesen, J. Wang and C. M.
Silicon Nanowires,” Applied Physics Letters, Vol. 78, No. I. Zardo, L. Yu, S. Conesa-Boj, S. Estrade, P. J. Alet, J.
Nanowires,” Nanotechnology, Vol. 20, No. 15, 2009, pp. No. 2, 2010, pp. 024005-024020. Y. Wu, Y. Cui, L. Huynh, C. J. Barrelet, D. C. Bell and C.
cular-Scale Silicon Nanowires,” Nano Letters, Vol. 4, No. voltaics,” Topics in Catalysis, Vol. 19, No. 2, 2002, pp. 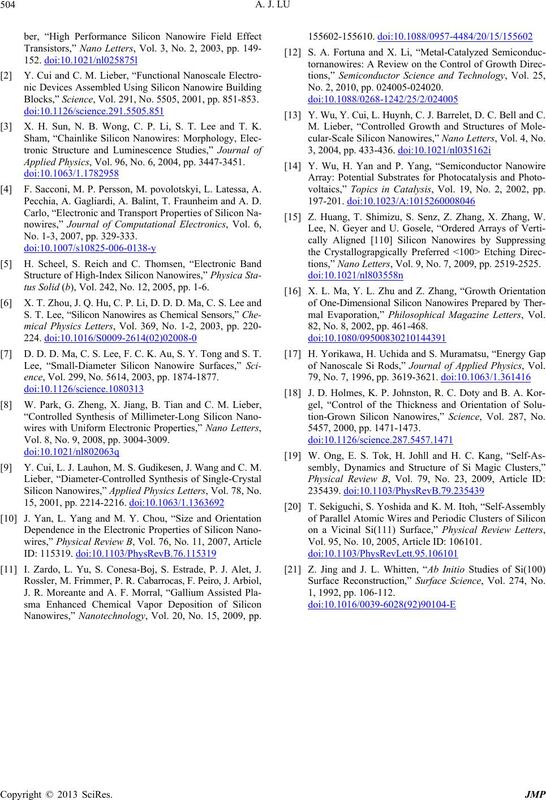 Z. Huang, T. Shimizu, S. Senz, Z. Zhang, X. Zhang, W.
tions,” Nano Letters, Vol. 9, No. 7, 2009, pp. 2519-2525.
mal Evaporation,” Philosophical Magazine Letters, Vol. 82, No. 8, 2002, pp. 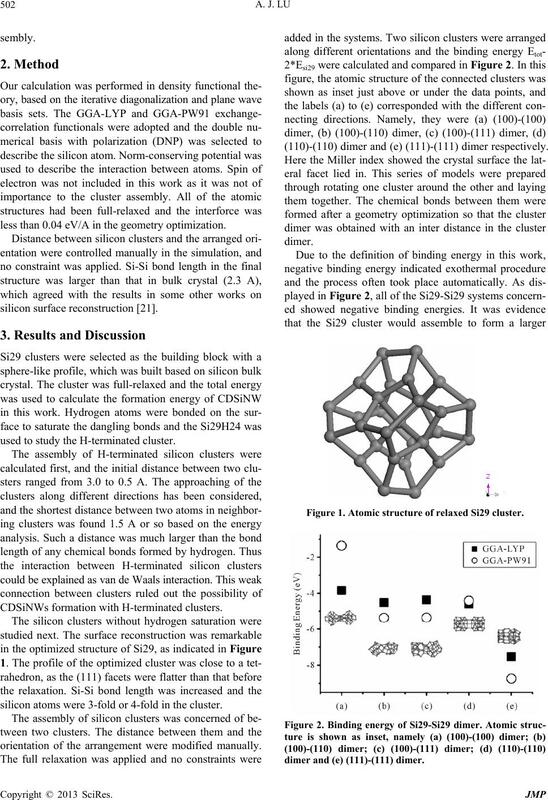 461-468.
of Nanoscale Si Rods,” Journal of Applied Physics, Vol. 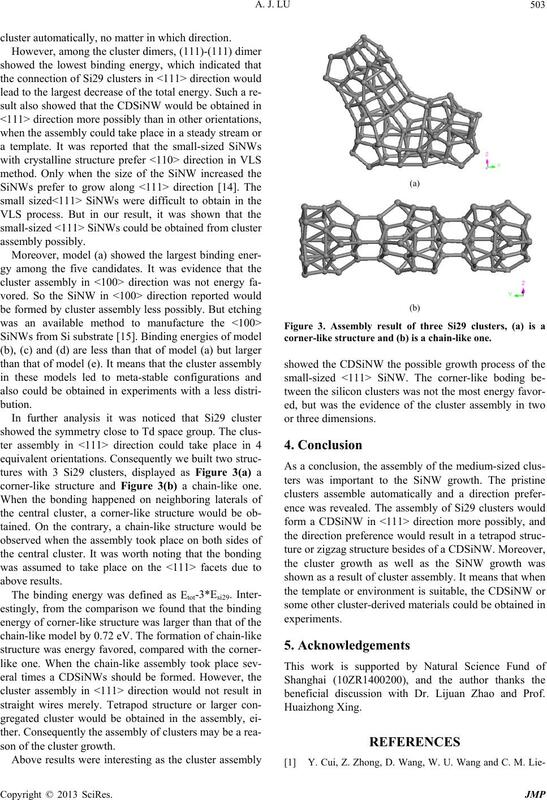 tion-Grown Silicon Nanowires,” Science, Vol. 287, No. Vol. 95, No. 10, 2005, Article ID: 106101. Surface Reconstruction,” Surface Science, Vol. 274, No.